Get access to exclusive discounts, the inside line on the latest gear, and personalized recommendations from our staff of avid riders. We never share your personal information. Earn $210.00 in VIP credit. Click to Learn More. Backorder: This item is currently out of stock but is available to purchase today as a backorder. The expected availability date shown above is our best estimate as to when it will be shipped to you, but this date is subject to change based on our receipt of this item from its vendor. Shipping in the continental US is free for all backorder items (for international orders, our customer service team will contact you when the item is available to ship). Your credit card will not be charged until your item ships (Paypal requires payment up front, but you can cancel for full refund). Anytime prior to shipment, your backorder can be cancelled by contacting our customer service team. 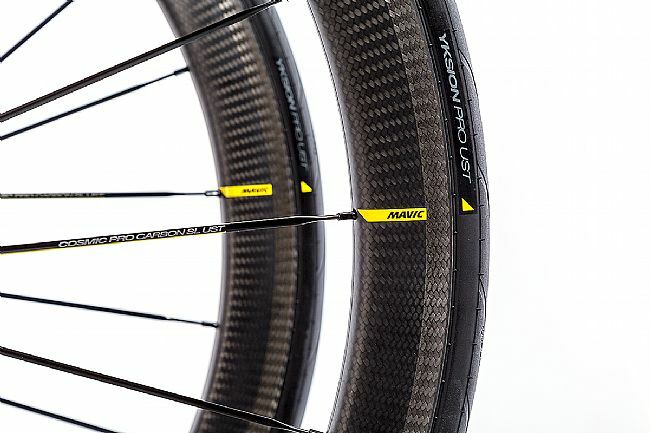 The new-and-improved Cosmic Pro Carbon SL UST Wheelset brings Mavic's UST Tubeless technology and a lightweight, aero design for the ultimate in carbon clincher performance. With UST's low rolling resistance and a smoother, more comfortable ride quality, the 40mm deep NACA-inspired rim profile reduces drag and improves crosswind stability. 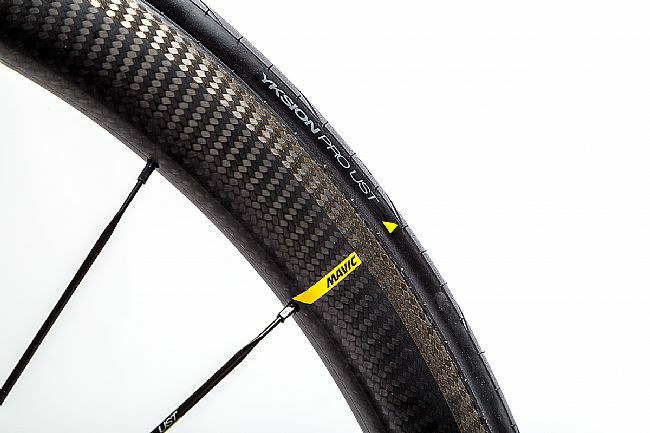 Produced with layers of continuous 3K carbon fiber to achieve a unique one-piece contour straight out of the mold, Mavic's iTgMax technology translates to superior heat management and more consistent braking. 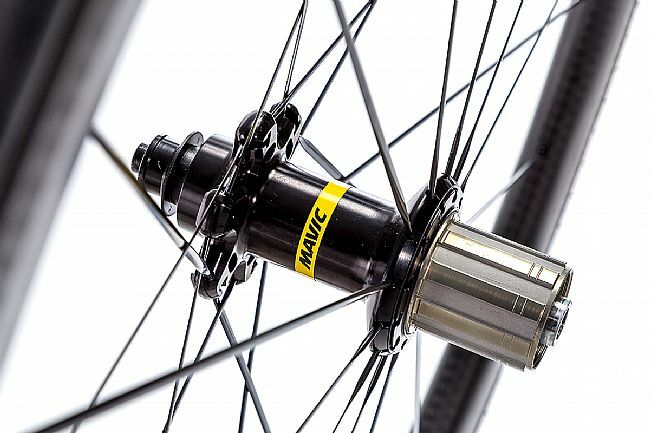 Down below, Mavic's hubs feature their lightweight, fast-engaging Instant Drive 360 freewheel system, laced with our patented aero spokes. 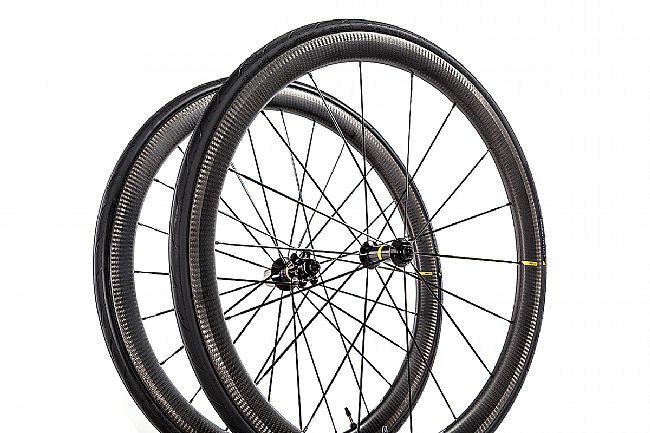 The Cosmic Pro Carbon SL UST Wheelset is part of Mavic's wheel-tire system and comes with Mavic's Yksion Pro UST Tires factory installed. Providing a simple, hassle-free tubeless road setup with high rolling efficiency and maximum grip in all weather. Also included is Mavic's tubeless sealant, sealant syringe, tubeless rim tape, BR601 titanium quick releases, multifunction adjustment wrench, carbon brake pads, UST valve, and accessories. Rim Material: 3K Carbon Fiber with iTgMax technology. 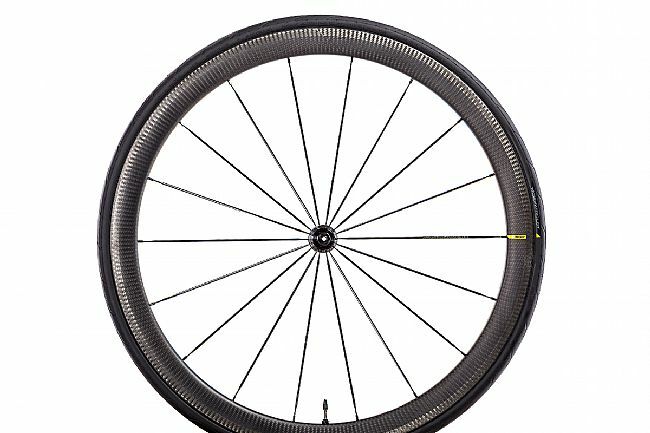 Wheel Size: 700c (622x19TC ETRTO). Tire Type: Clincher, tubeless ready. 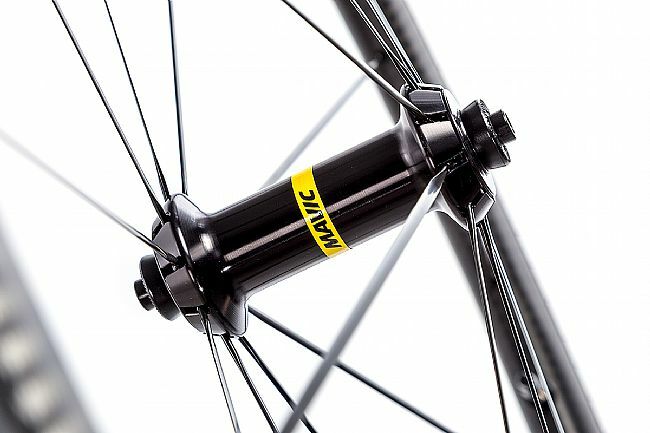 Hubs: Mavic alloy with Instant Drive 360 freewheel. Spokes: Straight pull, aero, double butted. Spoke Count: 18 front / 24 rear. Manufacturer Warranty: 3 year limited. Claimed Weight: 665g front / 825g rear / 1490g set. Please note: This product ships signature required. 2 of 2 customers found this review helpful. These wheels tick all the boxes in terms of low weight, good aero, good braking and relatively reasonable cost. I've used them in several crits plus a few longer events. Braking is very good, maybe on a par with alu, but hard to say. On a long ride I descended one of the more challenging hills in Malibu (Deer Creek) and I had no problems with overheating or loss of modulation. I'm very happy with these wheels. Maybe the high-end Zipps or Enve's are better, but I'd be surprised if the difference would even be noticeable for most of us amateur riders. We are committed to delivering outstanding value and service to our customers, every day. Try us today to see why so many of our customers come back again and again. *Orders received before 3:00PM Pacific time are shipped the same day (Mon-Sat). Orders over $50 are shipped free (USA only, excluding AK and HI). Some exceptions apply. See Shipping for details.